JBA Director Dr Josh Byrne has recently been recognised by the Planning Institute of Australia (PIA) for his contributions to planning in Western Australia. 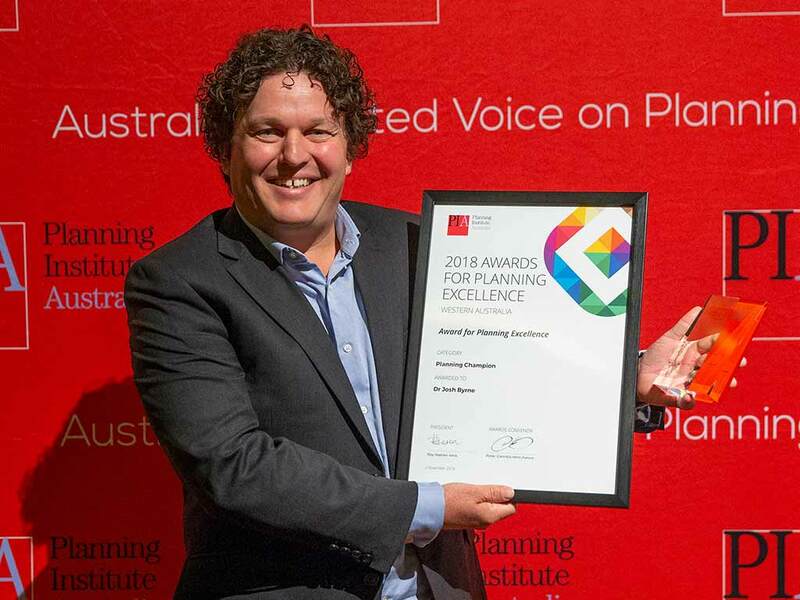 Josh was awarded the Planning Champion Award at the PIA Awards for Planning Excellence, an award that recognises non-planners for their advocacy and for making a significant contribution and lasting presence to the urban and regional environment. It is awarded to those who promote good planning, and the value of planning or the planning profession to the public. This year’s planning champion is a well-known media presenter, environmental scientist, author and academic, who advances his passion of the environment through planning projects. These projects transcend various sectors of state and local government planning, as well as the private sector. The scale of development, starts with single houses, culminating with large infill developments. His own home has been designed and constructed to provide it with the maximum environmental benefit, which has been extended to larger projects including Landcorp’s White Gum Valley (WGV), as well as projects in other states. This application of his diverse skill set has championed the value of good planning and design though a strategic mix of thought leadership, practical experience and social commentary. The annual PIA Awards for Planning Excellence demonstrate leading practice, leadership and achievement in planning and the planning profession. Planning strengthens communities, facilitates economic development and improves the choices available for where and how people live and work. It facilitates decision making and helps to balance private, government and community interests for net future benefit. Through their work planners identify hazards and reduce risks, while identifying and protecting environmental, social, cultural and heritage values.